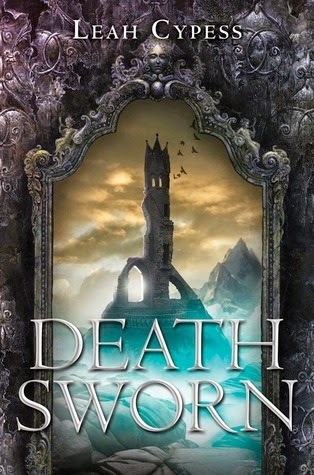 Katie Fatiga @ I Teach YA is saving yet more lives today with her recap of Death Sworn! Ileni, a former child sorcery prodigy, finds herself reluctantly exiled from her magical community. She has been tasked with the job of tutoring a rogue group of boy-assassins deep within a mountainous cave. This is basically a death sentence. The two previous tutors both met a mysterious and untimely demise. Ileni can only hope that she meets the same fate. Her only other path in life is to continue to live with the knowledge that her once excessive magical energy is quickly and permanently leaving her. Once inside the caves, Ileni is saddled with the constant guard of one of her students, Sorin. She has been placed under her care by the Master, the head of the assassins whom all of her students look to as if he is a god. The master only calls of Ileni once while she is under his employment, to illustrate his raw power and control over everyone and everything within the mountain. Ileni goes about her business trying to teach the young assassins without expending too much of her dwindling magical energy. She also attempts to uncover the truth behind the mysterious deaths of her predecessors. She continues to grow closer to Sorin, hr guide and protector within the caves. Eventually, Ileni realizes that she is the key to the Master’s plan to take down the Empire and has been, possibly, since before her birth. She is reluctant, however, to take the power offered to her since it will mean the destruction of lives she has grown to value. Ileni is a sorceress with extreme skill but dwindling power. Her people, the Renegai, have sent her to the Assassins’ Caves to tutor young assassins who have shown an affinity to magic and the skills to weild it. This is basically a death sentence as the two previous tutors have been murdered. Ileni figures that although her magic is scarce, she can still serve some purpose to her people by uncovering the plot that led to the murders of her predecessors. Upon entering the caves, Ileni is saddled with a “protector” in the form of a young assassin named Sorin. Sorin escorts Ileni to her first, and only, meeting with the Master (the leader of the group of assassins). The master is looked up to by the students as an unfailing guide in their everyday life. Most have been living in the caves since they were very young and many owe their entire being to the tutelage of the Master. In their brief meeting, Ileni is shown the raw power and unflinching loyalty of the Master. He instructs one of his students to jump out of a window and the assassin does not think twice before cowing to the master’s will. Ileni must attempt to tutor her students without expending the last remains of her magical ability. She does not want to divulge the fact that she is losing her magic, or else possibly lose the respect of her pupils (and possibly die at one of the assassins’ hands). Her students are mostly respectful with exception of Irun, an imperial import with a haughty attitude. Ileni is able to perform a small spell that uncovers the fact that the previous teacher, Cadrel was murdered using a magic wielded knife to the back. Late one night, Sorin invites Ileni to a gathering of young assissins. The party is jovial. There is wine and dancing. Ileni uses it as an excuse to forget her constant fear of death and loss of magic. Sorin lets is guard down and dances freely with Ileni. Also at this meeting, Ileni gets a glimpse into the life of one of her top students, Bazel. Bazel is not liked by many of his peers. He is clumsy and awkward. But at the party, Ileni notices that many of the other students are paying him close attention. She finds that they are trading him for pieces of rare chocolate. Ileni’s weakening magic leaves her tired and defenseless. Sorin offers to teach Ileni actual physical defensive skills (not knowing that she can no longer use most of her magic). Ileni continues to seek guidance as to the deaths of her two predecessors. She follows Bazel through the caves to a secret meeting with “traders” from the Empire. When she returns from this meeting, Sorin suspects that they were not indeed traders, but spies. Ileni requests a second meeting with the traders. She and Bazel return and Sorin follows them. In the mêlée that ensues, one of the “traders” is killed while the other, Karyn escapes, but not before offering Ileni a escape out on her boat (which Ileni surprisingly refuses). Sorin returns after following Bazel through the caves and is surprised that Ileni has not escaped. Cue make-out session. Later, back in her rooms, Ileni is cornered by Bazel and Irun. Irun attempts to kill Ileni but she uses the last of her magic to heal herself and catches Irun off guard, stabbing him in the back and killing him (surprising herself by how much she enjoys it). At this point, Ileni has a suspicion as to who actually did kill the previous teachers. She calls out Absolm (the 1st of the two teachers allegedly murdered in the caves), who appears before her. He has faked his own death so that she could be sent to the caves. He wants to combine her skill with the raw magical power taken from others so that together the Renegai and assassins can destroy the Empire. Ileni’s not buying it. She wants to find out what Karyn’s part is in this whole plan. Sorin and Ileni return to the caves to find Karyn. There is a show down where Karyn reveals the source of her magic, a swirling, colorful loadstone filled with black magic glean from the deaths of others. Sorin is almost able to kill her, but hesitates when he thinks of how he will look in the eyes of Ileni. The stone topples out of Karyns hand and into a deep cavern. Ileni rushes after it but it is far out of her reach and she almost tumbles into the abyss herself. Sorin is able to catch her leg and pulls her to safety. When the two return to the top of the cave, Absolm is waiting for them. He reveals that he would like to make a loadstone for Ileni and that her students are willing to sacrifice themselves to fill her with renewed magical energy. But Ileni cannot agree. She want to bring down the Empire but she wants it to be her choice. She does not want to be a pawn of the Master. She does not want to sacrifice her students. Ileni runs out of the cave and up the steps to the Master’s quarters. There she catches him off guard and stabs him (ostensibly killing him…probably not). She then returns to the mouth of the cave to start her journey to the heart of the Empire, leaving Sorin, to find her own truths and her own way to take down the Empire.